Two league games played in the FAWPL Southern Division this Sunday and 3 points at home for 2nd placed Crystal Palace Ladies see them close the gap on leaders Charlton Athletic Women to just 2 points. Hosting Gillingham FC Ladies the 2 sides were goalless at the half-time break Ellie Stenning scoring the opening goal for Crystal Palace then top scorer Gemma Bryan made it 2-0 to the hosts with her 30th goal of the season. Queens Park Rangers Ladies travelled to Wales on Sunday looking to build on last Sundays win against bottom side Swindon Town Ladies taking on a side just 3 points ahead of them Cardiff City Ladies. It was advantage to the visitors at half-time with QPR leading 1-0 thanks to a goal from Dominika Netschova in the 38th minute. Cardiff City finding an equaliser in the 63rd Zoe Atkins finding the back of the net to see the sides take a share of the points. Another useful point for QPR nevertheless as it brings them to within 2 points of the sides immediately above them, Gillingham and West Han United Ladies with 3 and 4 matches respectfully in hand on both. Getting through the ties now with the 2nd Round of the competition heavily affected by the weather in December seeing alot of postponement, the FA Women’s Cup taking precedence last Sunday. Two ties involving sides in the Southern Division and for the 2nd weekend running Charlton Athletic Women were taken into extra-time by their hosts before eventually winning through. Away to one of the sides looking to challenge them for the Southern Division title Charlton were in Essex to play C&K Basildon Ladies. It was Basildon who held the lead at the half-time interval, Angela Addison scoring her 15th goal of the season. It was Charlton’s own top scorer who got the visitors back on level terms 8 minutes into the 2nd half Charlotte Gurr on target with her 23rd of the season. No more goals in the 90 minutes the game went into extra-time and it was another of Charlton’s top shots that scored the winning goal Kit Graham making it 2-1 with her 20th goal of the season. In the the other all Southern Division tie, Lewes FC Women were at home to Portsmouth FC Ladies in the 2nd Round. Plenty of action in this one, the hosts taking the lead in the 20th minute Portsmouth, Eilidh Currie putting through her own net. Two quickfire goals on the half hour had Lewes storm into a 3-0 lead, captain, Katie McIntyre and then Sarah Kempson scoring. The visitors far from out of it saw Lewes clear twice of the line before the half-time whistle. Rachel Panting was on target for Portsmouth to pull it back to 3-1 on 57 minutes Lewes responding straight away to restore their 3 goal cushion Vicky Carleton with substitute, Georgia Bridges scoring in the last 10 minutes to seal a 5-1 win. As with the FAWPL Cup competition the Plate was affected too by the weather with 3 ties played this weekend involving sides from the Southern and South East Division One. West Ham United Ladies were on the road in the 2nd Round taking on South West Division One side Brislington Ladies. A brace from Rosie Kmita seeing the Southern Division side leading 2-0 at half-time. The higher league side going on to score more goals 2nd half Molly Peters making it 3-0 on the hour mark. Amber Stobbs and Kelly Wealthall also netting a goal a piece before Kmita wrapped up her hat-trick in the final minutes 6-0 the final score. Keynsham Town Ladies are going well in South West Division One were away in the 2nd Round of the FAWPL Plate taking on Swindon Town Ladies bottom of the FAWPL Southern Division it was another defeat for Swindon heavy too with Keynsham Town racking up double figures, Kerry Bartlett previously a prolific goal scorer for Cardiff City Ladies scoring 5 of Keynsham Town’s goals in a 10-1 win. Emily Arrell scoring in the 1st half for Swindon. It was an all Division One clash in the other 2nd Round tie played in the FAWPL Plate at the weekend with South East side Luton Town Ladies hosting their South West counterparts, Southampton Saints Girls & Ladies both at the time 4th in their respective leagues. Natasha Fensome scoring for Luton Town, Jess McKay also scoring to see the hosts hold a 2-0 lead at half-time. Luton extending their lead in the 2nd half with McKay netting her 2nd before Southampton pulled it back to 3-1 with Krystal Whyte scoring the goal Luton going on to win and reach the quarter finals. 4 matches played in the FAWPL South East Division one this Sunday. It was 2nd v 3rd with Leyton Orient WFC away to Milton Keynes Dons Ladies. 4 points between the sides going into the game. It was the hosts who took an early lead in the game with Charly Clarke putting Milton Keynes in front in the 13th minute. Into the last 5 minutes of the 1st half and Leyton Orient pulled it back to 1-1 with Vanessa Wilson getting the goal. Time for Milton Keynes to retake the lead in the 1st half with a minute remaining Louise Naylor on hand to put the ball into the back of the net. 2-1 the half-time score Milton Keynes successfully defending the advantage to claim all 3 points closing the gap on Leyton Orient. 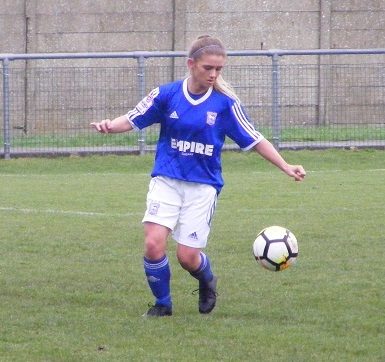 Ipswich Town Ladies move back into 4th place in the South East Division One table following a big win at home against bottom side Haringey Borough Women on Sunday. Leading 5-0 at half-time the hosts went on to win the game 9-0 to put themselves within reach of the sides above the once again. Sophie Welton (pictured) top scoring in the match with 4 goals. Captain Amanda Crump getting 2 goal in the match too with a goal each for Natasha Thomas, Cassie Craddock and Miagh Downey. A good result at home for Cambridge United WFC as they put pressure on the sides above them in the top half of the table in 6th were hosting Stevenage Ladies at Mildenhall Town FC on Sunday. Amber Cantwell’s goal the difference between the 2 sides at half-time giving Cambridge the lead. A good contest Stevenage with an opportunity to level from the penalty spot in the 2nd half with Amy Makewell brought down. Chloe Gunn stepping up to score to make it 1-1. Cambridge responding promptly however got up the other end of the pitch and Amy Howlett scored to put the back into the lead and go on to win the game 2-1. Norwich City Ladies 2nd bottom in the South East Division One table know they need points on the board if they are to have any hopes of pulling another side down into a scrap at the bottom of the table, were away on Sunday, Denham United Ladies immediately above them in 10th the gap 9 points. Annie Hewitt with the only goal of the 1st half seeing Denham leading 1-0. Into the 2nd half and Denham were awarded a penalty Alissa own stepping up to take and score. Down going on to score a brace to give the home side a 3-0 lead. A great strike from Natasha Snelling 3 minutes from time for Norwich seeing the game end 3-1. Denham moving above Stevenage into 9th, Norwich 10 points adrift of the sides above them but they have been down and out before and turned it around. This entry was posted in FAWPL Cup, FAWPL League Plate, FAWPL South East Division One, FAWPL Southern Division, The Round-Up and tagged FAWPL Cup, FAWPL Plate, FAWPL South East Division One, FAWPL Southern Division, The Round-Up on January 16, 2018 by WFEast.